Thanks to lower-order contributions, defending champions Vidarbha have fought back strongly against Saurashtra on day two of the 2018/19 Ranji Trophy final played at the VCA Stadium in Nagpur. Starting the second day on 200 for 7, Akshay Karnewar and Akshay Wakhare began with positive intent by putting pressure on Saurashtra bowlers. The left-handed batsman Karnewar reached his fifty off 124 balls while Wakhare showed great application. Chetan Sakariya dismissed Wakhare for 34 runs after the two batsmen had added 78 runs for the 8th wicket. 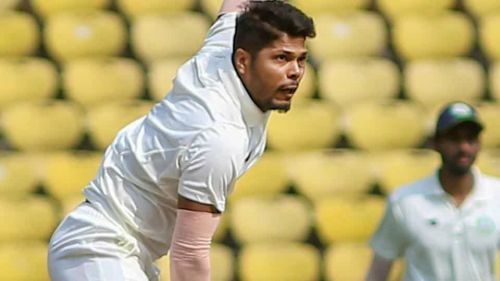 Umesh Yadav scored 13 vital runs in a 25-run stand for the 9th wicket. Saurashtra captain Jaydev Unadkat got his 3rd wicket of the innings by dismissing Umesh Yadav. Kamlesh Makvana ended the innings by getting the wicket of Rajneesh Gurbani. At the stroke of lunch, Vidarbha were bowled out for 312 runs. Karnewar remained not out on 73. After lunch, Harvik Desai and Snell Patel got Saurashtra off to a blazing start by adding 18 runs in just 2.3 overs. Aditya Sarwate got the breakthrough by dismissing Desai for 10 runs. Snell made batting look easy with his elegant stroke-play and put pressure on the Vidarbha bowlers. Sarwate got the second wicket when he dismissed Vishvaraj Jadeja for 18 runs. At the stroke of Tea, Sarwate got the prized scalp of Cheteshwar Pujara for just 1 run. Saurashtra went into the Tea break at 81 for 3. Snell Patel reached his half-century off 90 balls and controlled the game from his end. Wakhare bowled a beauty of a delivery to dismiss Arpit Vasavada for 13 runs. Vasavada and Snell Patel added 34 runs for the 4th wicket. Wakhare struck again by getting the big wicket of Sheldon Jackson for 9 runs only. Saurashtra ended the 2nd day on 158 for 5. Brief Scores: Saurashtra - 158 for 5 in 59 overs (Snell Patel 87*, Aditya Sarwate 3/55, Akshay Wakhare 2/42) trail Vidarbha - 312 in 120.2 overs (Akshay Karnewar 73*, Akshay Wadkar 45, Jaydev Unadkat 3/54, Chetan Sakariya 2/44) by 154 runs.